Release party was held at AIR in Tokyo Shibuya, Japan last Friday. 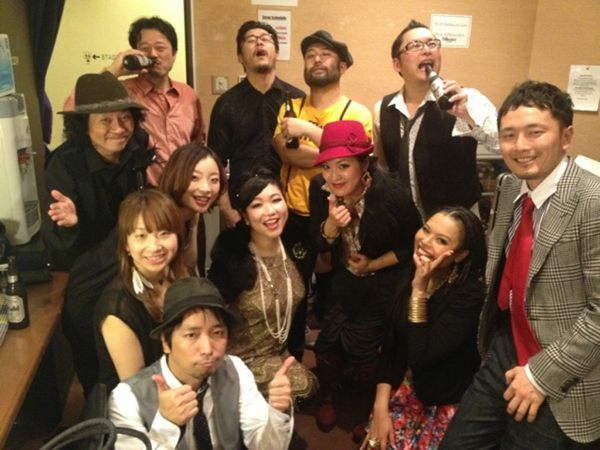 It featured a host of guest vocals from Mika Arisaka, Sonomi Tameoka and Eliana. Being a big fan of Jazztronik, it should be no surprise why I love this album as well. If you wanna have a Jazzy Christmas, then you should buy this great album tomorrow. In celebration of the album’s release tomorrow, here’s the timeless track Samurai played live at JZ Brat SOUND OF TOKYO on July 29th 2006. Another picture from the release party. I saw this picture on Mika Arisaka’s Twitter photo stream. Just wanted to interject and talk a bit about the newest album that I am currently listening to. It is called Experience by the Japanese pop-rock band Flumpool. I like some of their material. But, I was really excited about Experience due to the fact that it features a collaborative track with my absolute favorite, Jazztronik. The album came out on 12.12.12. It is excellent and especially the track with Jazztronik is da bomb! User asketch uploaded the teaser video featuring this track on youtube, which I have embedded here for your viewing pleasure. Can’t wait for Jazztronik’s new album, Jazztronik Studio Live Best! It’s coming out on 19th of December. Coming up tomorrow, my final conclusion articles on Prometheus. Sorry for having disappeared again. Before engaging myself in Prometheus, I wanted to talk a bit about music. Regular visitors of my blog know that I talk about my favorite musicians from time to time. I am a huge fan of Japanese Jazz and Electronic genre and I have talked about artists like Ken Ishii, Jazztronik, Nujabes and Kyoto Jazz Massive. When I was organizing my music collection recently, I realized that I should just put the word out about Ken Ishii’s album, Metropolitan Harmonic Formulas – Music for Daydreams that was released in February 2012. This album is one of a kind folks. It is probably one of the best albums that you would ever hear as far as crossover electronic music is concerned. It features many of my favorite artists like, Jazztronik, Tokyo Black Star, Masaki Sakamoto and Emi Meyer. Ishii-san has always been a creative force and he has put together a wonderful combination. I love all the tracks. But, being a huge fan of Jazztronik’s early works, I have to say that my number one track in the album is After the Rainstorm remix featuring the soothing pianos of 野崎 良太 – Ryota Nozaki. Sadly, two more remixes of After the Rainstorm are not available in this album. You should get the Music for Daydreams EP for them. Honestly, if you are into this kind of music don’t think, just head to beatport or amazon and get both these albums. I promise, you won’t be disappointed. As usual, I am posting another Jazztronik track called, Real Clothes (JTK New Remix) and it’s from the OST album of a movie of the same name. It is a made for TV Japanese film, released in 2008. Enjoy listening. Posting another track from Jazztronik that I like. Its called Beauty-Flow (Incognito Session) from the album Grand Blue, which was released in 2007 and features vocals by Lorraine Cato. Enjoy listening. Jazztronik released a new album, Dig Dig Dig last month. I have been listening to it for a while and I kinda like the track, Deja vu featuring AISHA. So, here is the track for your listening pleasure. Currently listening to some classic Jazztronik material, so thought of posting another piece by Nozaki. This track is called Feel the air and another one of my favorite Jazztronik tracks. A bit fast paced with some excellent electronica. Have a listen. As I had mentioned earlier, I am a fan of Jazztronik aka Ryota Nozaki. The fact that I like Nu Jazz and House, it wouldn’t be surprising as to why I like Nozaki. One of my all time favorite tracks of Jazztronik has to be Samurai. It’s a very popular track and I was lucky enough to see him perform it live. Have a listen.